The power stage of the source utilizes Power Width Modulation (PWM) technology, which ensures high efficiency and results in very small thermal losses. The stage is driven by an on-board Digital Signal Generator (DSP). The control signal can composed of harmonics with independently defined amplitudes and phases. The internal feedback loop utilizes DSP technology, while advanced algorithms ensure the high stability of amplitude and phase angle, as well as low distortion of the output voltage over a full range of allowable loads of various attributes. A multilevel protection system protects the source from overload, short circuit, overheating and makes device operation reliable and safe. The VIS is equipped with an isolated serial interface and can be operated from a PC or other controlling device (host). A variety of sources can be synchronized and operated together to form a poly-phase system. The communication protocol is able to control output settings as well as to access all internal registers. 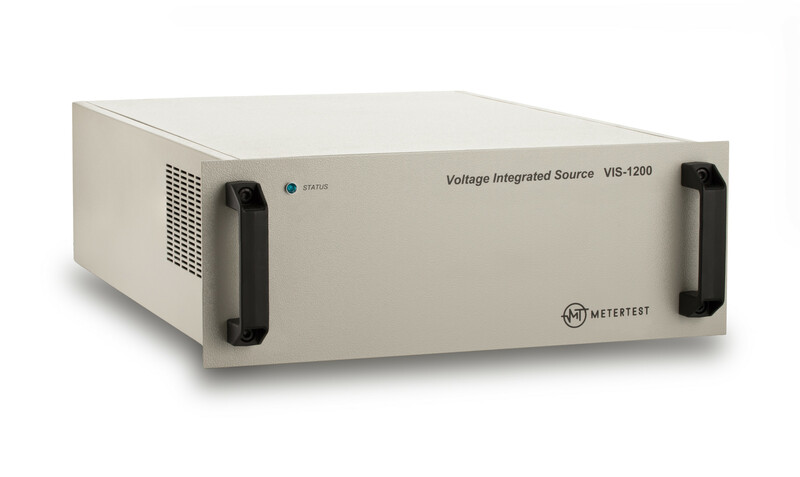 The VIS voltage integrated source is housed in a 19 inch plug-in case. Standard version of the VIS voltage integrated source is able to generate harmonics up to the 21st order. The enhanced harmonics version of the VIS source, marked with H, can generate harmonics up to the 41st.